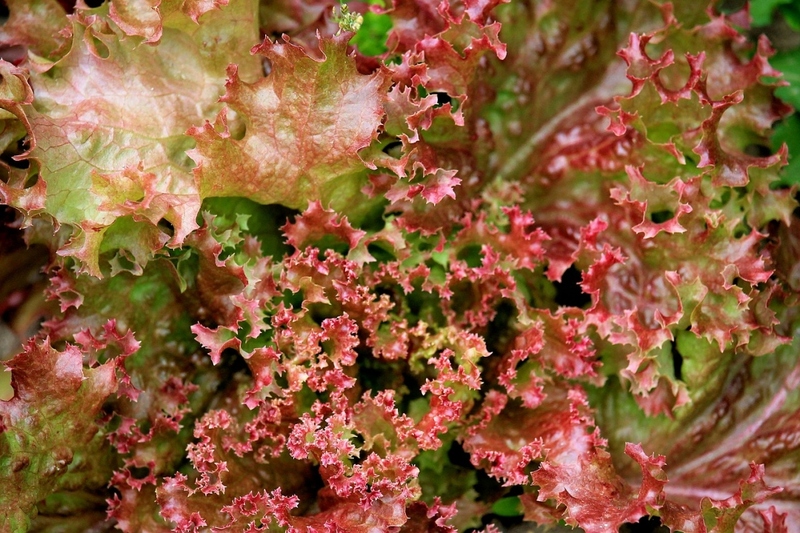 ‘Lollo Rossa’ lettuce (Lactuca sativa var. crispa 'Lollo Rossa'): growing, planting, caring. A lettuce with a sharp Italian accent. Very curled leaves a light green with stunning bright red edges : a mild and tasty lettuce. The leaves are tender, with curly edges and they are purple in color. This lettuce has a rather spreaded habit. Lettuces need water, otherwise they dry or produce seeds! Water two to three times a week in dry weather, and watch for leaves that show the first signs of dehydration. Sow in a cool and humus rich soil, avoiding too much sun exposure as this will produce flowers too quickly for your lettuce. Sow in shelters in February and March, and in open soil from March to September. Space the rows 30 cm apart, and seed very lightly, because you will only keep one plant every 25 cm: you can mix the seeds with salad to facilitate handling. Work the top soil carefully, without leaving any clumps, by delicately raking. Water lightly with a watering can, or spray them, so as to not wash away the seeds. Plant every 30 cm making a hole with a dibble, in a cool soil sheltered from the sun. Be careful not to bury the leaves of the seedlings, it will cause them to rot. The roots of lettuce are still very fragile; handle them with care! Watch out for slugs! Attract them away, with mulch and decomposed leaves and fruits - so they will leave your greens alone. After sprouting, thin out the plants by leaving only one every 20-30 centimeters to facilitate their growth. Of course, you can transplant these sprouts right away in new rows! Plant every 30 cm by making a hole with a dibber in cool soil without too much sun. Be careful not to bury the collar of the young plants, which will cause them to rot. The lettuce's roots are still very fragile; handle them with care! Looseleaf Lettuces can be cut several times as they go to seed more slowly. Harvest the oldest leaves - those from the outside - first, to spread your harvest period. Only for winter varieties. Mulch the lettuce plants with untreated mulch (be careful if you collect mulch from a farmer that used a growth regulator — no one wants dwarf lettuce). Fertilize your entire garden in the month of November with decomposed manure or compost that is not necessarily very decomposed. Cover it with a mulch of leaves and wood (so as to not only provide nitrogen elements that destabilize the soil).